The SH-20 laser safety shutter consists of two SH-10 laser safety shutters based on a single mount going the opposite directions to make a large aperture. Each shutter consists of a blade mounted on a rotary solenoid. When the shutter is powered, the blades move to an "ON" position and clear the path for the laser beam. When the power is turned off, the return springs of the shutters move the blades to an "OFF" position to block the laser beam. THE SHUTTER IS IN THE "CLOSE" POSITION WHEN THERE IS NO CURRENT. The standard blade material is 0.02" thick anodized aluminum. To meet laser specifications and for other uses like X-ray other materials and thickness are used. We offer standard and custom shutters. For the 5V laser safety shutter: 5V dc, 1400 mA. For the 12V laser safety shutter: 12V dc, 600 mA. For the 24V laser safety shutter: 24V dc, 320 mA. SH-20 shutter comes with a mounting plate that allows horizontal or vertical mounting, 2 million cycles minimum. SH-20-L shutter comes with a mounting plate that allows horizontal or vertical mounting, 50 million cycles minimum. SH-20-B shutter is boxed with a 1" dia through hole for laser light, 2 million cycles minimum. Horizontal or vertical mounting optional. SH-20-B-L shutter is boxed with a 1" dia through hole for laser light, 50 million cycles minimum. Horizontal or vertical mounting optional. SH-20-PI shutter has position indicators to indicate the position of each blade to verify the status of the shutter (open or close). Each blade has two magnetic switches that work together as one switch (they are connected in series). When the blades are in the "CLOSE" position one pair of the magnetic switches is close and the other pair is open. When the blades move to the "OPEN" position the close switches open and the open switches close. A three pin MOLEX connector (P/N 22-03-2031) is used for the output of the position indicator. 2 million cycles minimum. Horizontal or vertical mounting optional. SH-20-PI-L shutter has position indicators to indicate the position of each blade to verify the status of the shutter (open or close). Each blade has two magnetic switches that work together as one switch (they are connected in series). When the blades are in the "CLOSE" position one pair of the magnetic switches is close and the other pair is open. When the blades move to the "OPEN" position the close switches open and the open switches close. A three pin MOLEX connector (P/N 22-03-2031) is used for the output of the position indicator. 50 million cycles minimum. Horizontal or vertical mounting optional. SH-20-PI-B shutter has position indicators to indicate the position of each blade to verify the status of the shutter (open or close). Each blade has two magnetic switches that work together as one switch (they are connected in series). When the blades are in the "CLOSE" position one pair of the magnetic switches is close and the other pair is open. When the blades move to the "OPEN" position the close switches open and the open switches close. A three pin MOLEX connector (P/N 22-03-2031) is used for the output of the position indicator. The shutter is boxed, with a 1" dia through hole for laser light. 2 million cycles minimum. Horizontal or vertical mounting optional. SH-20-PI-B-L shutter has position indicators to indicate the position of each blade to verify the status of the shutter (open or close). Each blade has two magnetic switches that work together as one switch (they are connected in series). When the blades are in the "CLOSE" position one pair of the magnetic switches is close and the other pair is open. When the blades move to the "OPEN" position the close switches open and the open switches close. A three pin MOLEX connector (P/N 22-03-2031) is used for the output of the position indicator. The shutter is boxed, with a 1" dia through hole for laser light. 50 million cycles minimum. Horizontal or vertical mounting optional. L= Long life: 50 million cycles min. Damage threshold: The standard blades of the SH-20 shutter is 0.02 inch thick black anodized aluminum, which withstands 100 mW/mm.sq. with a limit of 2 Watts of total power. We also offer solutions that meet laser specifications, different wavelengths and more powerful laser beams. We offer a veriety of materials and thicknesses suitable for laser light, X-Ray and plasma, from VIS to FIR applications. Please call to discuss your specific application. You can also indicate the most suitable material for your application and supply your own mirrors, gratings or other attachments. The standard blade material for the SH-20 is 0.02 inch thick black anodized aluminum. - Reflective blades, polished Nickel plating. You need to absorb the reflected beam with a beam dump. - Gold plated blades. You need to absorb the reflected beam with a beam dump. - Mirrors, enhanced aluminum coated, epoxied onto the blades. You need to absorb the reflected beam with a beam dump. - Mirrors, gold coated, epoxied onto the blades. You need to absorb the reflected beam with a beam dump. - Mirror, silver coated, epoxied onto the blades. You need to absorb the reflected beam with a beam dump. You can activate the laser safety shutter by applying the appropriate voltage: 5V to the SH-20-5, 12V or 15V to the SH-20-12 and 24V to the SH-20-24. If you opt not to use our drivers we supply you with schematics to build your own driver. Please click on "CAD DRAWINGS" for details. The DSH-20 DRIVER operates the SH-20 Laser Safety Shutter. The DSH-20 driver includes a three position control switch. In the "OPEN" position, the shutter is continuously open. In the middle position, the shutter is continuously closed. In the "TTL" position, an external TTL signal controls the shutter. A high or open circuit at the TTL input sets the shutter in the closed position. A low or short to ground at the TTL signal sets the shutter in the open position. The DSH-20 driver can driver two SH-10 shutters simultaneously. The DSH-20-110 or theDSH-20-220V, a cased driver 5.3" x 5.3" x 2" operating from a line voltage of 110Vac or 220Vac (please specify DSH-20-110 or DSH-20-220). The DSH-20-110-BNC or DSH-20-220-BNC, a cased driver 5.3" x 5.3" x 2" operating from a line voltage of 110Vac or 220Vac (please specify DSH-20-110 or DSH-20-220) with a BNC connector (for the TTL input connection). The DSH-20-110/220, a cased driver 5.3" x 5.3" x 2" with a selector switch for operating from a line voltage of 110Vac or 220Vac. The DSH-20-110/220-BNC, a cased driver 5.3" x 5.3" x 2" with a selector switch for operating from a line voltage of 110Vac or 220Vac with a BNC connector (for the TTL input connection). OPERATING VOLTAGE: [SH-20-5, SH-20-12 or SH-20-24]. When ordering without a driver, please indicate one of the operating voltages: 5V, 12V or 15V, or 24V. BOXED:-B, 6-32 tapped mounting holes are standard. Optional mounting holes: M4, M6, 8-32 and 1/4-20 . EXPECTED LIFE:standard=2M cycles or long life [-L] 50M cycles min. - Reflective blades, polished Nickel. Example: PART NO. SH-20-B-L-TANT-1/4-20 with DSH-20-110-BNC. 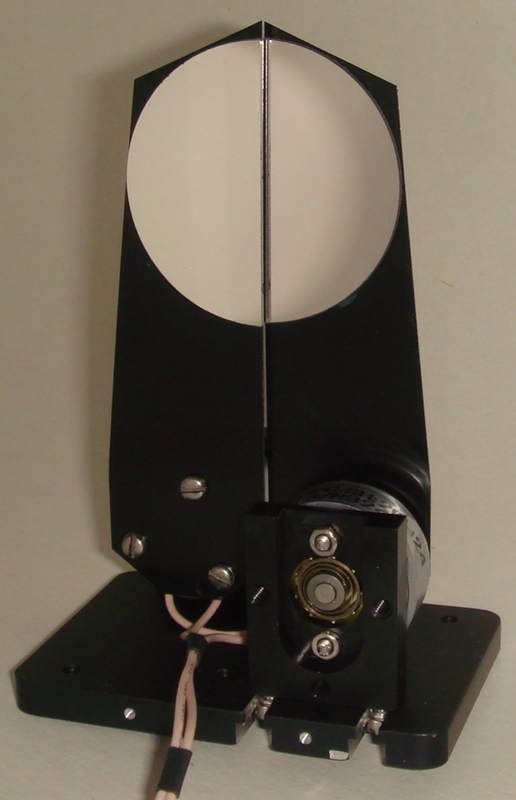 This part number specifies the model SH-20 laser safety shutter, boxed with a cutout for laser light long life, (50 million cycles minimum), with tantalum blades and with 1/4-20 mounting holes to fit an optical table and with a cased driver 5.3" x 5.3" x 2" operating from a line voltage of 110Vac with a BNC connector for TTL input. Example: PART NO. SH-20-PI-B-L-gold plated blades with DSH-20-110/220-BNC. This part number specifies the model SH-20 laser safety shutter, with a position indicator to verify the status of the shutter (open or close), 50 million cycles minimum. The shutter is boxed with a cutout for laser light. The blades are gold plated. The cased driver 5.3" x 5.3" x 2" is operating from a line voltage of 110Vac or 220Vac with a BNC connector for TTL input.